The role of laboratory testing remains a core pillar for disease management where rapid diagnosis and timely and appropriate intervention are central to quality healthcare. When samples are to be sent to the laboratory for analysis, they are governed by the factors of timeliness and cost. Autonomous schemes help a lot in this respect. One only has to consider the use of pneumatic tubes which is now an indispensable function in many hospitals. More recently, the use of drones, or unmanned aerial vehicles (UAVs), has been explored for outdoor biological specimen delivery. Their benefits have mostly been claimed to be in the context of remote venues. However, it is clear that if the aspects of safety can be overcome, such deliveries will also be vital in traffic-congested urban environments, where route planning strategies can only offer limited improvements in timeliness. The focus of the research team has been to look at how the timeliness aspect can be further augmented by having parts of the pre-processing of samples done en-route during transport. The major challenge lies with the fact that the payloads that one can place on UAVs are limited. The quest began with the attempt to address the problem of mixing. Appropriate mixing of samples is arguably the most common sample handling step which is key to obtaining quality specimens for laboratory testing. In the case of blood collection into receptacles, proper mixing for homogeneous dispersion of silica particles, separator gels, clot activators or anti-coagulants is vital for optimal downstream separation of serum or plasma. Controlling the level of agitation applied during mixing is also important for minimizing hemolysis of red blood cells, which could render the sample unsuitable for testing. Automated methods for mixing are generally based on sustained and controlled agitation for specific periods of time. The limited payload of a typical quadcopter drone will render it unfeasible to attach devices such as vortex mixers onto it for sample transport and mixing in tandem. In addition, the forces generated by a vortex mixer in operation can disrupt the planned flight pattern of a quadcopter. 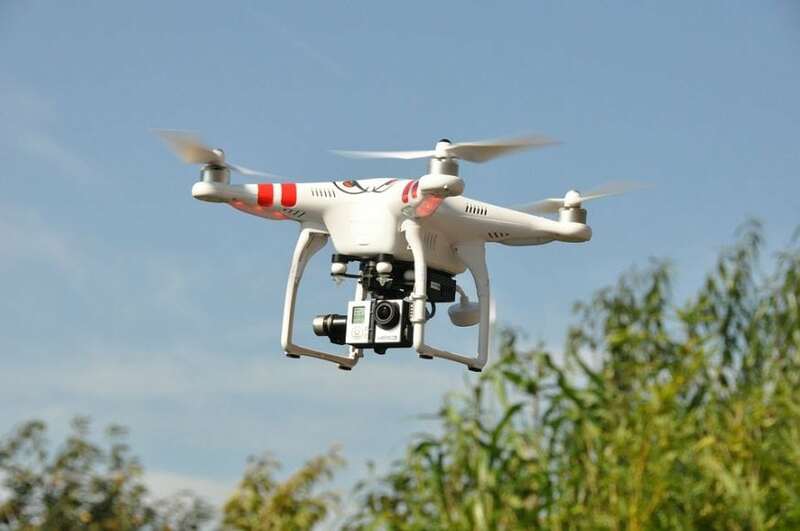 A solution was found by harnessing the flight maneuvering capability of the quadcopter itself. The aerodynamic lift in quadcopters, as opposed to fixed-wing aircraft, is generated by four vertically oriented propellers. This allows movements to be generated laterally, longitudinally, and rotationally with ease. In the flight control of many quadcopters, there is a built-in capability for them to perform flipping (looping) maneuvers. This is generally offered as a means of showcasing their aerobatic abilities, where the control schemes needed to attain the kinematics has been well studied. The team confirmed the ability of this maneuver to helpfully mix samples in-flight. The attention has now shifted to sample centrifugation en-route. Again the challenge was how to do this without lugging a centrifuge along with the quadcopter. We have successfully achieved this by making minor alterations the propellers on the quadcopter itself. In full flight, the rotors of the quadcopter can spin at a rate exceeding 10,000 revolutions per minute. This is more than sufficient to conduct centrifugation. The results of this investigation, which is in its final stages at this moment, will be sent for reporting very soon. Beyond this, the team has lined up a series of other processes that can be tackled. It will be a busy but exciting time ahead. 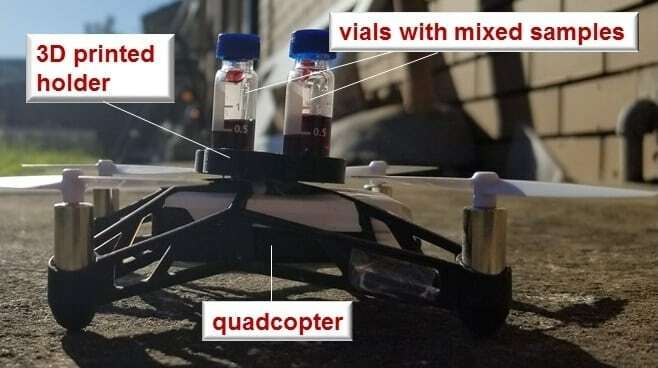 These findings are described in the article entitled Drone inflight mixing of biochemical samples, recently published in the journal Analytical Biochemistry. This work was conducted by Mayur Katariya, Dwayne Chung Kim Chung, Tristan Minife, Harshit Gupta, Alifa Afiah Ahmad Zahidi, and Tuck Wah Ng from Monash University, and Oi Wah Liew from the National University of Singapore. Tuck Wah Ng is an associate professor of mechanical and aerospace engineering at Monash University. He has interests in biochemical analysis, cell-particle manipulation, and instrumentation development. He leads the Laboratory for Optics and Applied Mechanics. He has authored/co-authored over 150 peer-reviewed publications.